Chippewa Valley Correctional Treatment Facility is a minimum security prison that specializes in housing inmates with alcohol and substance abuse issues. The facility is considered an alternative to a traditional prison and inmates who are at Chippewa Valley Correctional Treatment Facility have been placed there as an alternative to revocation. This prison opened in 2004 and is an all male facility that has a capacity of 450 inmates but currently houses around 490 offenders. Three hundred beds are provided to inmates in alcohol and substance abuse treatment, the other 150 beds are reserved for offenders who work in and outside of the facility. The facility itself consists of five stories and is shaped in an X. Inmates are housed in a dormitory style living area that contains 8 to 11 men. Chippewa Valley Correctional Treatment Facility is a tobacco free correctional institution. This prison provides full medical, dental and mental health services to offenders. In addition to multiple substance abuse programs, Chippewa Valley provides classes and programming in computers, adult basic education, GED, parenting, and re-entry. Inmates can also participate in community service projects that include removing trash and debris from local roads and highways, landscaping cemeteries, and providing labor to various projects and agencies in and around Chippewa Falls Wisconsin. 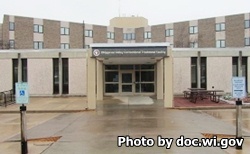 ​For more information, read the Chippewa Valley Correctional Treatment Facility Visitors Guide.